Innate immunity occurs immediately as a first response to infection. In this phase, cells are activated by conserved molecular patterns associated with pathogens. Adaptive immunity, characterised by cytokine production, cytotoxic activity and antibody production, occurs later. In this stage, cells are able to respond to specific antigens; to this end, the processing and presentation of the antigens are essential. In adaptive immunity, subpopulations of B and T cells can survive as memory cells. After re-exposure to the same antigen, these specific-antigen memory cells can rapidly mobilise. As a result, the adaptive immunity will respond rapidly and effectively to pathogens that have been encountered previously. The following figure summarises the actors and components that participate in innate and adaptive immunity. 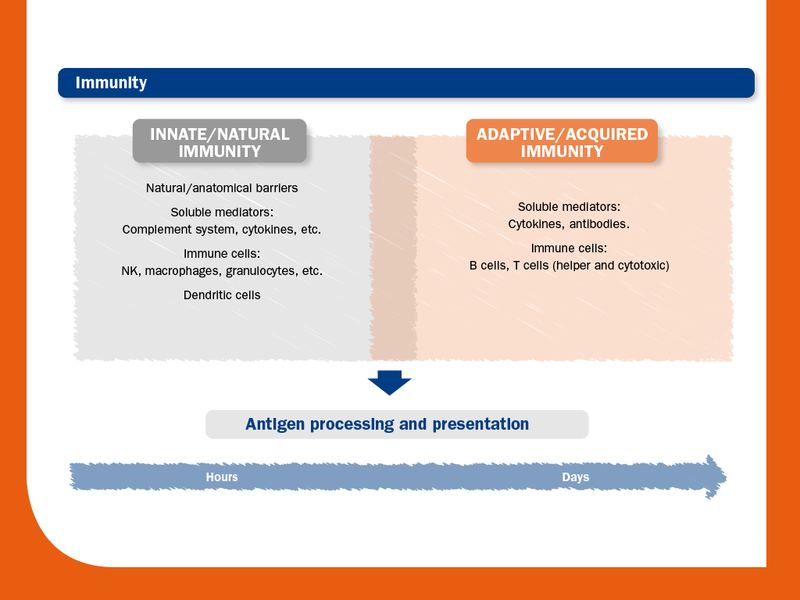 Innate immunity includes important processes such as inflammation and antigen presentation. As we have seen, innate immunity recognises and responds to pathogens in a generic way and it does not confer long-lasting immunity. Thus, its main feature is the ability to respond quickly and broadly against infections and other problems/alterations. Apart from natural barriers, innate immunity includes both humoral (complement system, cytokines, etc.) and cell-mediated immunity components. The components of cell-mediated immunity include: granulocytes (basophils, eosinophils and neutrophils), macrophages, mast cells, dendritic cells and natural killers. Although it might seem that innate immunity is just a coarse first line of defense against infections, it is essential for the development of adaptive immunity. In fact, innate signals drive the activation and polarisation of the four major T helper (Th) subtypes, which are key elements in adaptive immune responses. As Ths are unable to recognise antigens by themselves, antigen processing and presentation by antigen-presenting cells (APCs) is required. APCs include dendritic cells (DCs), macrophages and B cells; however, DCs are considered the professional APC for the priming of naïve T cells. Thus, it can be said say that DCs are a bridge that connects innate and adaptive immunity. The differentiation and polarisation of T helpers is driven by APCs. The co-stimulatory molecules present in the surface of APCs and the released cytokines that are present in the immediate cell milieu act as the signals that drive the activation and polarisation of the four major T helper (Th) subtypes. Th1 cells. The main cytokine released by Th1 cells is IFN-γ. Th1 participate mainly in protection against viral infection though IFN-γ and the activation of cytotoxic lymphocytes, which kill virus-infected cells. IFN-γ can also activate macrophages. Th1 cells also help B cells for antibody production. Th2 cells. This Th subtype plays a central role in antibody production, secreting cytokines that participate in the activation and differentiation of B cells into B plasma cells, also known as antibody factories. Th17 cells. These cells play a crucial role in extracellular pathogens (bacteria and fungi), recruiting and activating neutrophils and macrophages. It seems that Th17 are also induced during viral infection, but their role in the protection against viruses is still unclear. Treg. As implied by their name, the major function of Treg cells is to regulate immune responses. They are very useful for preventing the development of responses against self-antigens (autoimmunity) and limiting an excessive immune response against a pathogen (infection-induced immunopathology). 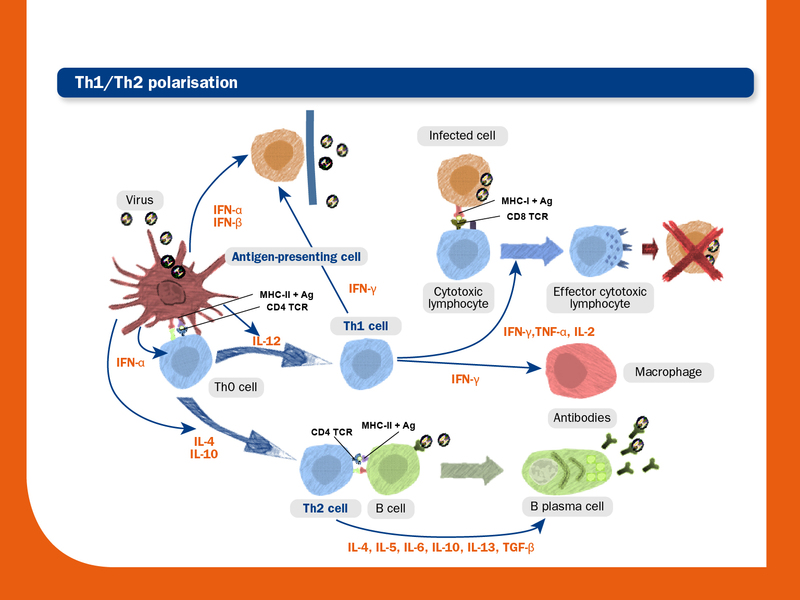 The image below shows an overview of the adaptive immune response (Th polarisation towards Th1 or Th2) after virus recognition by APCs. 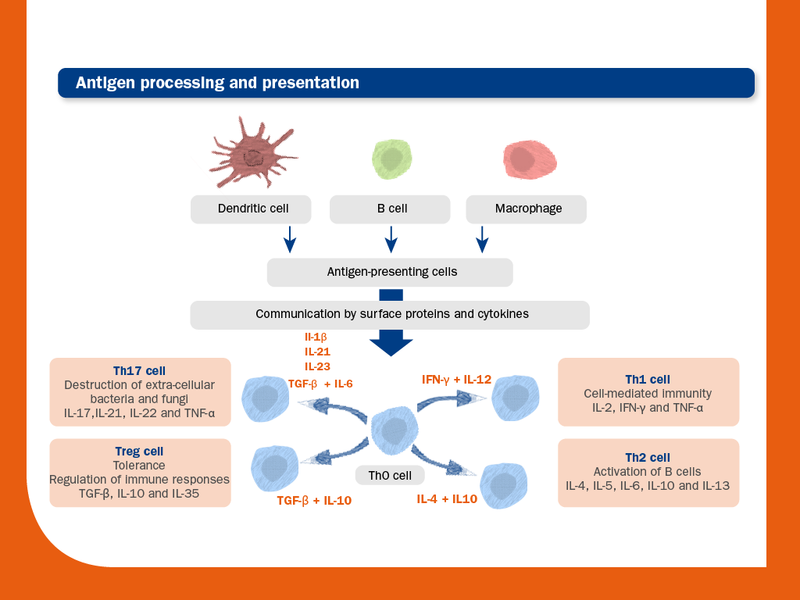 Antigen-presenting cells (APCs) process and present the antigen to the T cell Th0. Signals from the APCs before and during the antigen presentation drive differentiation and expansion of Th cell subtypes. Th1 polarisation produces IL-2, IFN-γ and TNF-α. This results in activation and differentiation of the cytotoxic lymphocytes, which directly kill virus-infected cells. Activated Th2 cells produce B cell-stimulating cytokines that promote B cell differentiation into B plasma cells, which produce large amounts of antibodies.